One of the lamentable legacies of the Great Schism of 1054 for the Orthodox Church, was the loss of its link to the West and knowledge of its ecclesial history and traditions, subsequently many of its great luminaries and saints were lost within the memory of the wider body of the Orthodox Church. However, over time with the advent of Orthodox congregations appearing within Western countries and the numerous conversions made by Westerners to Orthodoxy, as well as marriages into those congregations, the Church has witnessed a “rediscovery” and “renaissance” of Orthodoxy’s Occidental heritage, as an ever-increasing number of Westerners seek to find their “roots” within the Church of the Scriptures and undivided Christianity. This particular trend is rather poignant in regards to the British Isles where there has been concerted efforts made towards a “return” to the early heritage of pre-Schism and pre-Reformation Anglo-Celtic Christianity. This is not surprising given the issues and hard questions that are confronting Christians within secularised Britain, and the difficulties of the many church denominations there in being able to respond in a uniform or coherent fashion to those demands. The lamentable example of the Anglican Church is a case in point, and we will continue to read and hear within the mass media the ongoing struggle that is raging at the moment in their efforts to maintain unity. Naturally this has prompted what might be termed as an “era of inquiry” by these British Christians in seeking to learn what Orthodox Christianity has to say and do, only to discover that it shares more in common with their ancient heritage than many of their present British religious affiliations. To the wider body of Orthodox Christians this has been a chance to learn and rediscover many of the beauties of British Christianity, which as tradition indicates to us, has a direct historical link with the Apostles and their time. Historians are slowly affirming this point due to the limited resources and evidence that has actually survived down to our time. What we can affirm is that Britain was a place of refuge for many Middle Eastern and Greek Christians fleeing from persecution by various Jewish and Roman authorities. It was these circumstances that saw the birth of the Church in Britain when Saints Joseph of Arimathea and Nicodemus the Pharisee, as well as Aristobulus the Apostle (Barnabas’ cousin), settled in Britain, Aristobulus as tradition tells us became Britain’s first Bishop. It was Christian refugees like those mentioned which brought St Alban face-to-face with Christianity and inspired him on his journey towards faith and love. Unfortunately, for many of us Orthodox Christians St Alban’s story is one that had been lost to us for many centuries, as well as the services that were dedicated to his memory. Yet if his story is not well known to us, it is also partly due to the confusion within Western Churches over the date of his martyrdom and the clarity of the sources that speak of his martyrdom, since much of the evidence was destroyed in the time of King Henry VIII’s reign and onwards, when sites of pilgrimage and monasteries were burnt and confiscated by the English crown. Much of what survives can now be found in France, Germany and Switzerland, because of the pious efforts of unknown British Christians who fled to Europe taking whatever they could salvage. Thankfully, the scholarly work of a certain Dr John Morris of London who had dedicated his efforts to studying the dating of St Alban’s martyrdom, came to the conclusion that St Alban’s martyrdom occurred on 22nd June 209 AD, and not in the 4th century during the time of Diocletian’s persecutions as hagiographers like St Bede the Venerable had asserted. According to Morris the confusion seems to stem from a mistranslation by St Gildas in his writings c. 540 AD, who was then followed by St Bede in c. 700 AD. In any case, Morris cross-referenced this with the extant copy (found in Turin in 1901) of Constantius’ life of St Germaine that was originally written in 480 AD. Within this text Constantius cites that St Alban’s execution occurred on 22nd June, but he failed to provide the year. Nevertheless, he did indicate that the Roman Emperor involved was Septimus Severus, and says “Then the emperor Severus went to Britain…When it became clear that there were very many Christians there, with his customary fury he ordered them to all be put to the sword”. St Gildas’ error stemmed from when he was copying this text, for he apparently read the word “Severus” as an adjective, and not as a name. Within a gloss, St Gildas supposed that the emperor was the notorious anti-Christian Diocletian. St Bede in following the information set down by St Gildas’ hagiography of St Alban, omitted the “supposed” and incorporated the gloss in the text of his hagiographical work, and so the Diocletian dating became established. Yet, Dr Morris correctly points out, it could not have been Diocletian since he ruled as Emperor in the East. Maximillian ruled the Western portion of the empire with Constantius as his assistant who was responsible for Spain, Gaul and Britain. Constantius’ wife St Helene, was a Christian. Furthermore, a contemporary account emphatically states that while this Caesar “showed willingness” by knocking down a few meeting places of the Christians, he killed none. Meanwhile, what we know about Severus was that he was in Britain from the summer of 208 till his death in 211 AD. He had with him his wife and two sons. We also know that he took his elder son up north to deal with the Caledonians in 209, leaving his younger son Geta Caesar in charge of Britain for three to four months till his return. Furthermore, the Turin manuscript relates what occurred after St Alban’s martyrdom; “Then the evil Caesar, aghast at such wonders, ordered the persecutions to end, without the orders of the emperors, setting down in his report that the religion prospered from the slaughter of the saints…” From this baffling passage Morris was able to deduce that the evil Caesar in questions was Geta and thus was able to place the martyrdom of St Alban on 22 June 209. 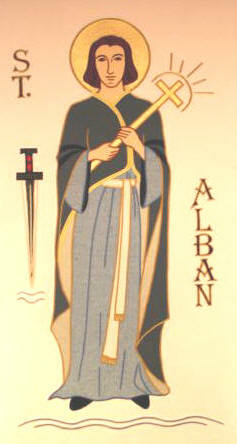 The manuscript also relates that St Alban, “was almost certainly a high-born native of Verulamium who had probably held military rank, privileged with Roman citizenship in the same way as was the Jew, St Paul of Tarsus…” Thus reaffirming the ecclesial tradition about the details of St Alban’s life as a native Briton (Celt), who served as a high-ranking officer within the Roman legions, and possibly belonged to an influential family that were previously tribal leaders. The final point that Dr Morris alluded to, was that given this dating it could be asserted that St Alban was not only the Protomartyr of Britain but he would also be the first documented martyr of Latin Europe. Therefore, the account we will relay is the one that tradition has passed down to us despite the mistake over the dating of St Alban’s death, since all the other points have remained the same since St Alban’s martyrdom; because it belongs to the earlier original oral account from which the Turin manuscript also draws upon. I have also added a few points to help clarify certain points of the account which we may not understand today since we are divorced from the events in respects to time and society, but not the implications and spirit though; for each year when we mark St Alban’s commemoration we are re-living the events of his martyrdom. 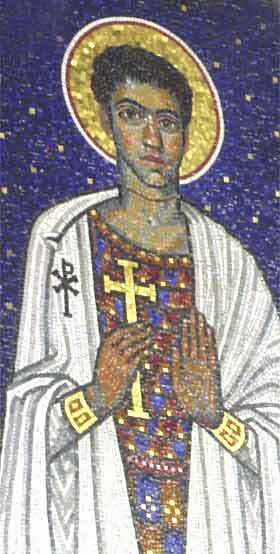 An early mosaic of St Alban wearing the priestly robe over his military dress. It is the earliest surviving depiction we have of the Saint. Whilst persecution of Christians across the empire was raging, there was a priest named Amphibalus who had fled to Britain to find refuge. In the city of Verulamium (now St Alban’s) there was a pagan named Alban, who was a high ranking military official and had been given commands to locate Christians and apprehend them, or to execute them on the spot if need be. This man named Alban, at the time had left Verulamium for a brief hiatus and was enjoying the comforts of his country estate (villa) which was located on what we know as Chantry Island. The poor fugitive priest who in desperation sought refuge ended up at Alban’s doorstep, not knowing who Alban exactly was, nor his commission. Nevertheless, Alban had pity on the priest and took him in and provided shelter. During the course of the following days, Alban observed the way of life that Amphibalus led, whose dedication to unceasing prayer and vigil day and night, kindled this curiosity. Thus Alban began to engage in discussion with Amphibalus to see what this Christian faith was all about, in order to ascertain just exactly what is the threat posed by this “cult” that the authorities were so keen to stamp out. It was therefore Alban’s wish to not condemn a man without knowing on what grounds he should be charged or even executed, since this would not be just. Yet Amphibalus’ example of faith and piety, as well as his catechetical discourses inspired Alban to imitate his example. Gradually with Amphibalus’ salutary encouragement, and relinquishing the darkness of idolatry, Alban became a whole-hearted Christian. While Amphibalus remained under his hospitality for some days, news reached the ears of the impious prince that one of Christ’s confessors, for whom the role martyr had not yet been assigned, was lying low in Alban’s villa. As a result, he straight away ordered soldiers to make a careful search for him. When they came to the martyr’s villa, St Alban soon showed himself to the soldiers in place of his guest and mentor, dressed in the man’s clothes, the hooded cloak that he wore, and was led off to the judge in bonds. It happened that at the time Alban was brought to him, the judge was offering sacrifices to the pagan gods at the altars. When he saw Alban, he became enflamed with anger at the fact that Alban had ventured to offer himself of his own free will to the soldiers in place of the guest he had harboured, and thus to expose himself to danger. He ordered him to be dragged to the images of the gods before which he said: “since you prefer to conceal that profane rebel rather than surrender him to the soldiers so that he might pay the penalty he deserves for his blasphemy and contempt of the gods, you will suffer the penalty for which he was due if you attempt to reject the rites of our religion”. This was an attempt by the judge to learn who Alban’s kin were, in that way he could put pressure on Alban to recant his Christian faith via blackmailing him with threatening to imprison, torture or execute his parents and next of kin. Hence, Alban replied: “what business is it of yours of what lineage I am born? If on the other hand you desire to hear the truth of my religion, know that I am now a Christian and devote myself to Christian service”. The judge said: “I seek your name, so tell me it without delay”. Alban replied: “The name given me by my parents is Alban, and I revere and ever worship the true living God, Who created all things”. Then, filled with anger, the judge said: “You wish to enjoy the blessings of a long life, do not refuse to offer sacrifices to the great gods”. Alban replied: “These sacrifices which you offer to the pagan gods can neither help their recipients nor fulfil the wishes and desires of those praying. Rather, whoever offers sacrifice to these images shall receive as his reward the eternal punishment of Hell”. When the judge heard this, he was roused to great fury and ordered the holy confessor of God to be beaten by the torturers in the belief that since words had failed, he could weaken the constancy of his heart with the lash. Though afflicted in most cruel torture, Alban bore it with patience and even with joy for God’s sake, and when the judge realised he could not be overcome by torture or enticed from the rites of the Christian religion, he ordered him to be beheaded. As he was being led to his death, Alban came to a river (known today as the River Ver) which separated the town from the place of his execution by its very swift course. There he saw a large crowd of people, both men and women of all ages and social class, who were clearly drawn by divine impulse to follow the blessed confessor and martyr. They filled the bridge over the river to such an extent that they could scarcely all get over before nightfall. Some eyewitnesses claimed it was a deliberate attempt of public support to bar the bridge from being crossed by the executioners to lead Alban to his death. From other eyewitness accounts we also know that the other but minor bridges that crossed the river were destroyed by the crowd who sought to prevent or delay any attempt of Alban’s execution. Whatever the case may have been, since almost all of Verulamium had gone forth to witness the events of this injustice, the cruel judge had been left behind within the city unattended. So, St Alban, in whose mind was a burning desire to come quickly to his martyrdom, and would not tolerate any delays approached the river torrent, and raising his eyes to Heaven in prayer, he then gazed upon the river which instantly dried up and a dry path being formed from the river mud on which he could walk upon. When the executioner himself saw this, along with the officials and other executioners accompanying Alban as well as the crowd, he hastened to meet Alban when he came to the place appointed for his execution, doubtless urged on in this by divine impulse. Casting away the sword he held ready drawn, he threw himself at his feet and earnestly desired that he himself be thought worthy of being executed either with the martyr he was ordered to slay or in his place. So while he was turned from being a persecutor into a companion in the True Faith, and while there was a very proper hesitation among the other executioners in taking up the sword which lay on the ground, the most reverend confessor ascended the hill with the crowds. The hill lay about five hundred paces from the arena, and, as was fitting, it was fair, shining and beautiful, adorned, indeed clothed, on all sides with wildflowers of every kind; nowhere was it steep or precipitous or sheer but Nature had provided it with wide, long-sloping sides stretching smoothly down to the level of the plain. In fact, its natural beauty had long fitted as a place to be hallowed by the blood of a blessed martyr. When he reached the top of the hill, St Alban asked God to give him water and at once a perpetual spring bubbled up, confined within its channel and at his very feet, so that all could see that even the stream rendered service to the martyr. For it could not have happened that the martyr who had left no water remaining within the river would have desired it on the top of the hill, if he had not realised that this was fitting. The river, when it had fulfilled its duty and completed its pious service, returned to its natural course, but it left behind a witness of its ministry in the presence of the spring. And so in this spot, the valiant martyr was beheaded and received the crown of life which God had promised to those who love Him. But the man who set his unholy hands upon that pious neck was not allowed to rejoice over the death, for his eyes fell out of their sockets landing on the ground alongside the blessed martyr’s head. Beheaded too at the time was the soldier who previously had been impelled by the will of Heaven to refuse to strike the holy confessor of God, and thus becoming Britain’s second martyr of the Faith. Then the judge, upon hearing of the events, particularly the great and unprecedented heavenly miracles, was greatly awed and frightened prompting him to order a halt to the persecution. Some had speculated that the public reaction to the events was what inspired the judge to desist. However, from all indications, there was the beginning of a genuine change within his character, whereby he began to pay honour to the slaughter of saints, through which previously believed he could force them to relinquish their allegiance to the Christian faith. The blessed Alban suffered on the 22nd of June near the city of Verulamium. And it was on the spot of martyrdom, when peaceful Christian times finally came, that a church of wonderful workmanship was built, a worthy memorial that honours St Alban’s sacrifice and faith. To this day, sick people are healed at this place and the working of frequent miracles bring it renown. In more specific terms what we know is that not long after St Alban’s martyrdom, a church was built on the hill where his confession of Christ took place. While Amphibalus (whose name actually refers to the cloak that a priest wears) was martyred elsewhere, and his relics together with the former executioner were placed alongside St Alban’s. As for the city of Verulamium its citizens eventually shifted their settlement to congregate around the church that was built on the hill where St Alban was martyred. Yet, for the people of the British Isles or Verulamium, peace would remain tenuous throughout the centuries with numerous invaders and political movements threatening the safety and sanctity of that hallowed place. After the initial invasion and settlement of the pagan Anglo-Saxons (the forefathers of the English), the threat to Verulamium’s holy site was removed with the progressive evangelisation of the Anglo-Saxon chiefdom of Mercia by the native Celtic missionaries. Its King, Offa, travelled to Verulamium where he established a monastery with a cathedral on the site, thus replacing the existing church in c. 793 AD. Yet during the period of the pagan Danish invasions which heralded the Viking era, the holy relics of Sts Alban, Amphibalus and the Former Executioner were removed for safekeeping to the Monastery of Ely. 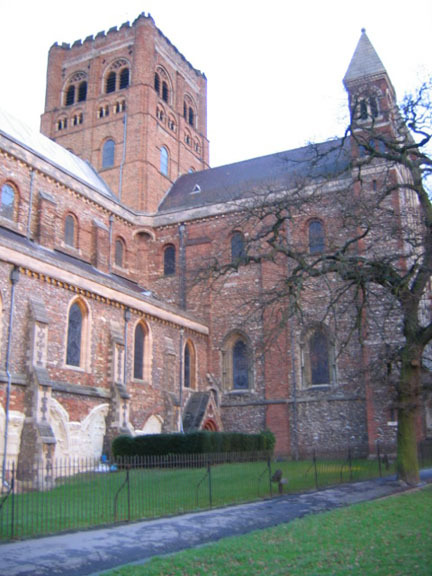 When the Danish threat had passed and the monks of St Alban’s requested the holy relics back, an altercation with the monks of Ely developed over their refusal to return them, giving way to a dispute that lasted a few centuries. 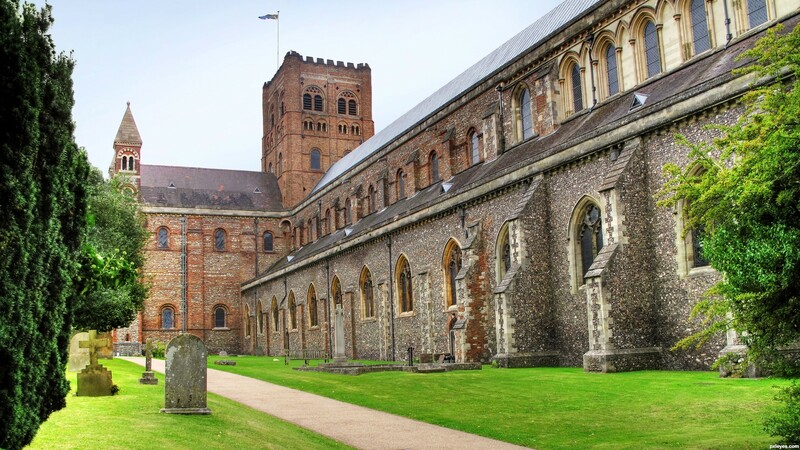 Nevertheless, St Alban’s Abbey received their protector back and went on to become one of England’s premier Abbeys during the High Middle Ages. After the Norman conquest (1066 AD) of England, the Normans wishing to impress the populace with their reverence for the island’s Saints, began to repair and rebuild the cathedral in 1077. While in the 14th century a new chapel and an elaborate shrine were constructed to house the relics. Regretfully, in the 16th century, the impious hands of King Henry VIII’s minions desecrated and destroyed the shrine during the dissolution of England’s monasteries. The holy relics were broken up into various pieces and dispersed all across Western Europe to avoid being destroyed by Protestant reformers who viewed them as items of superstition or idolatry, and forbidding the veneration of Saints. The reasons for St Alban’s survival within the memory of the Church, as well as his relics, is in part due to the fact that he is the guardian and protector for people who are imprisoned, taken hostage, being tortured, enduring persecutions, serving in the armed forces, converts, and healing the blind or those who are gravely ill.
Thankfully, in spite of the many setbacks, the Cathedral of St Alban’s was painstakingly restored some time after Henry VIII’s passing, and in 1877 was assigned to serve as the cathedral of the diocese of St Alban’s. Furthermore, in June 2002 a clavicle (collar bone), believed to be a relic of St Alban, was presented to St Alban’s Cathedral and placed inside the saint’s restored 13th century shrine. The bone was given by the Church of St Pantaleon in Cologne, Germany. Like St Alban’s Cathedral, St Pantaleon was formerly a Benedictine abbey church which had a shrine dedicated to St Alban, and is believed to have had some relics of the Saint since the 10th century. 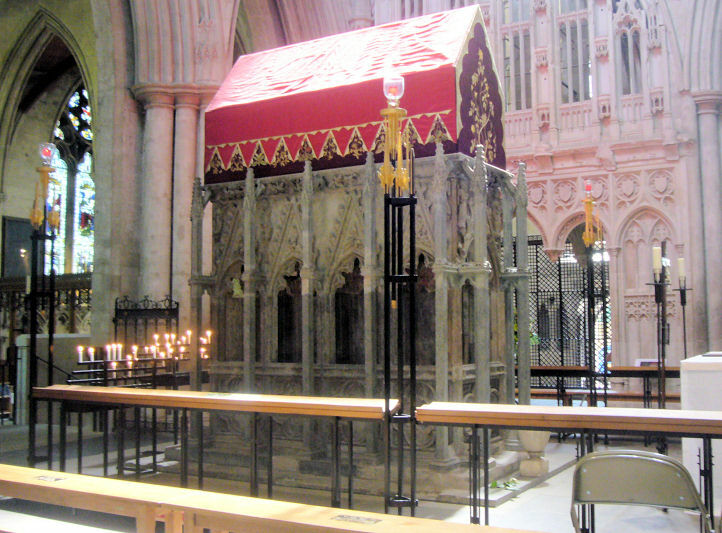 It is also possible that further relics of St Alban were acquired by St Pantaleon during the 16th century when King Henry VIII’s edict decreeing the Dissolution of Monasteries in England saw many such relics being smuggled abroad to avoid destruction. 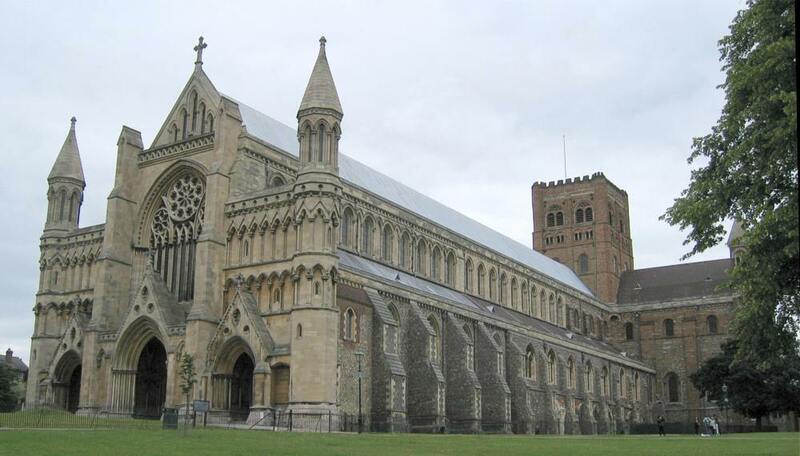 St Alban’s as an Abbey (Monastery) was dissolved in 1539. We dedicate this article to all the Orthodox Christian faithful of the British Isles, particularly to our Welsh brethren, who are the direct descendants of the indigenous Britons who gave our beloved Church a Saint as great as Alban, and whom still preserve St Alban’s native language and culture. – V.M. Both these Saints are commemorated on Sunday of the Myrrh-Bearers, while St Joseph also is commemorated on 31st July, but according to very ancient manuscripts from Palestine both had a joint feastday on August 31st . Commemorated on 16th March as well as 31st October. As a personal conclusion to this enigmatic Saint who seems to allude time and survive various tribulations, I would like to cite that there does exist an Orthodox apolytikion (dismissal hymn) and service dedicated to St Alban. The difficulty, is in locating this particular service or its apolytikion, and I should cite that if anyone is able to get hold of it, to not lose it. And if possible, if you could please forward on a copy of this service on to us at Mode of Life Project (mode_of_life@hotmail.com). It certainly will be greatly appreciated, for we would be able to pass it onto others who are also seeking this liturgical service. On behalf of Mode of Life Project – V.M.